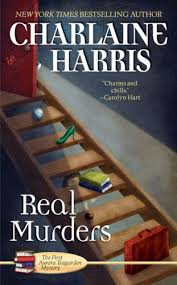 As I continue into Real Murders, by Charlaine Harris, Aurora Teagarden seems to be the unluckiest person in the world. The dead bodies are piling up, and the members of the Real Murders Club are getting more and more worried about their own safety; but more-so for the safety of their friends and relatives. Body #2 – Morrison Pettigrue; running for Mayor, his campaign manager is in the club. The death imitates the Murat case from long ago. Bodies # 3 & 4 – Mr. and Mrs. Buckley, Parents of Lizzane Buckley, friend of Roe’s and member of the club. Actually, it was her step-mother and her father, and her real name is Elizabeth. Any guesses what famous murder of old this is staged after? Oh. Yeah. They were hacked to death. That should help you figure it out. I am getting close to the end of this book, and to likely stumbling upon body #5. It isn’t going to end this quietly, and I know something much, much worse is in store for Aurora, and the town of Lawrenceton, Georgia. Do you have an answer about the staged murder? What Should I Crack Open Next? I am looking at a couple books on my shelf that I haven’t read in so long, I do not remember what they were about. I have to say though that they couldn’t have been all that horrible or they would be in a box in my basement that I have no intention of ever opening again. 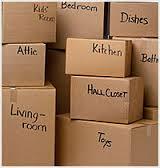 Have you ever moved and kept moving unopened boxes from house to house? I boxed up stuff and moved it into my house, in the basement. Lived there 11 years. Hauled those same boxes, never opened, back upstairs and into my new basement. Guess what? 4 years later, and they still aren’t opened. It’s almost like having my own personal time capsules that I never intended to make. Honestly, at this point, there can be any number of things in these boxes that I would rather not be reminded of! So, I am thinking of getting back into Charlaine Harris’s Murder Mysteries series with Aurora Teagarden as the heroine/detective/always in the wrong place at the right time. I have read a few of these, but not all of them. I wish she would stop writing the True Blood series and focus on this one instead! Have you read these wonderful little books? They are a quick read, fun and full of mystery. Or do you have a book in mind that I must absolutely read? If you do I would love to find it and read it!